“Now did you know that this Christmas Pudding recipe is the one that was used by your Great Great Grandmother who was the Housekeeper to the Earl of Enniskillen?…” Well yes, Mum we did because you’ve told us every Christmas since I can remember. But now she’s gone this creaking family tale isn’t wheeled out any more, and I miss it, and her. But we still use the recipe, it’s in my Mum’s neat handwriting, but smeared with sticky pudding ingredients and titled “Christmas Pudding – Great Grandma’s (b 1832) Recipe’, and the older I get and the more I learn about my family’s history of unremarkable occupations in domestic service, scythe-grinding, agricultural labouring and dressmaking the more pleased I am to have this personal connection back through generations of my female forebears – even if some of the information is, as yet untraceable or has been mixed up with other relatives. My mother’s platitude would sometimes provoke mild, derisory huffing from my other half as I think he interpreted it as a statement of snobbery – an attempt perhaps to demonstrate that my family had connections with the aristocracy – but my Mum was too much of a liberal to admire the upper classes, and I felt that the point was that my Great, Great Grandma was to be remembered with pride because she was a good cook, good enough to be employed by people who could afford to be discerning. 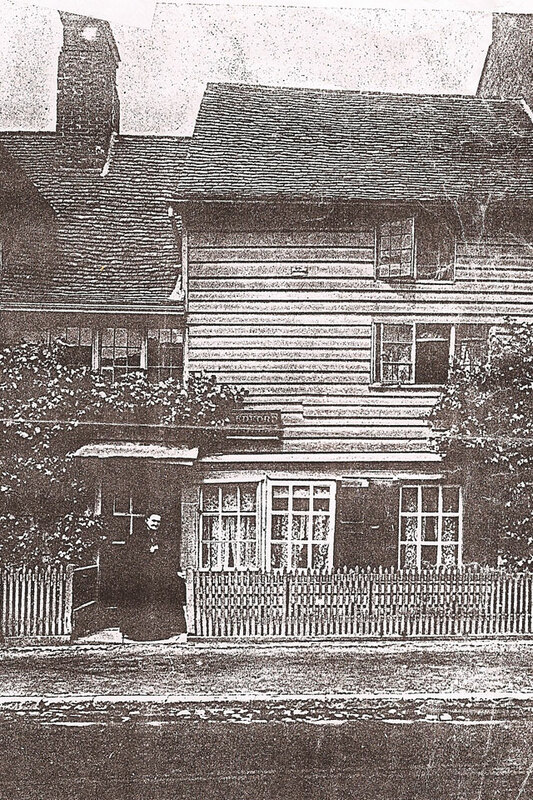 I have spent the last few years trying to track down the story of this housekeeper and though I do have a Great, Great Grandma Walters from Hampshire, who seemed at first the most likely candidate – being cook and housekeeper in a large house amongst several other servants in Pinner, Middlesex, in 1891 – she was too young to fit the date on the recipe; and the owner of the house, her employer, was a soapmaker, hardly aristocratic material! 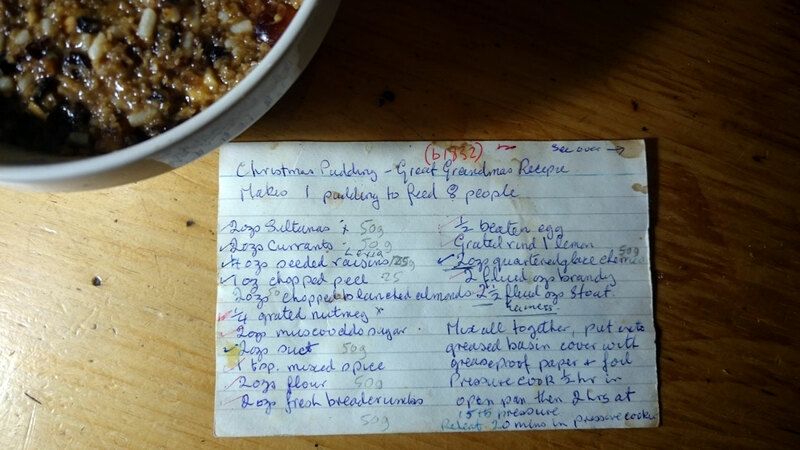 Just recently I’ve been sorting through a lot of family memorabilia and found in my mother’s recipe folder (which I cannot discard) another copy of the recipe, in her handwriting again, titled ‘Granny Manning’s Christmas Pudding’, and another for “Great Granny’s Mincemeat”. Finally I believe I’ve found the right Great Great Grandmother! Not only was she born in about the right year (actually 1831) but she was also married to a coachman – the other bit of the story that often accompanies the Earl of Enniskillen tale, although there is no evidence of Mr Manning working for any grandly titled employers. This fabled woman is my Great, Great Grandma, Charlotte Manning, nee Bedford (see photo at end of post), a family and her own mother and grandmother were also ‘natives of the village’ of Pinner where she lived until the ripe old age of 90. There’s a long, now severed, connection with the place; at least six generations (traceable back to the mid 1700s) up to and including my mother, were all born within a few miles of each other, and one of my mother’s earliest memories (she thinks she was about three) was of being in her very aged grandmother’s house in Pinner and screwing up pieces of paper that Grandma would flatten for her with an old fashioned smoothing iron. However, Charlotte wasn’t ever a housekeeper as far as I can tell – a needlewoman in later life but no record of being a cook, and further investigation suggests the recipe may even be from Mrs Beeton’s 1861 Book of Household Management. But I just sense that Charlotte is, if not the originator of the recipe, at least the earliest remembered disseminator. So maybe the pride in her being a cook with a good reputation is misplaced after all – these recipes are just one of those things that mothers handed down to daughters (and incidentally my mother and grandmother were both excellent cooks), especially when they lived near to one another. And in the process of handing down, some genuine facts become conflated (there was another coachman in the family who was employed by some very minor gentry whose name sounded a little like Enniskillen), and though not deliberately falsified perhaps some details became amplified into a single, and more-coherent-than-real-life story. I’m delighted to carry on the traditions – of making the pudding, usually with family and friends to join in the stirring and wishing, and of passing on the recipes, in this generation to my sons, if they’d like them! They are both excellent cooks too, maybe there’s a genetic trait here! Click on any of the pictures below to open in a slideshow. 1988 Christmas pudding stir-up, oldest son far right, youngest in green, plus family friends. The family heirloom silver threepeny bits that are hidden in the (cooked) pudding for lucky finders, but they have to be returned! 2017 stir-up, oldest son, now 29 years bigger. My Great, Great Grandmother Charlotte Manning, aged 80, in front of a house that was occupied by the family over several generations in Pinner High Street in 1912, possibly the house my Mum remembers visiting.